What is a Blog? from Lynne Laburn on Vimeo. Get ready to adjust the volume between the introduction music and the little girl talking! Why should you set up a classroom blog? "If you always do what you've always done, then you'll always get what you've always got..."
* include lessons or lesson extensions which are great for students who are really engaged in what you are learning and want to learn more! * include great websites which will provide more practice at home, thereby reducing the number of paper practice worksheets. Can an e-mail do all that?? 2. Remember and record your user id and passwords... that's easy right?? Oh wait until after summer holidays... you may be surprised how hard it can be to remember! - Later on you can ask about adding gadgets and widgets... Remember... babysteps.... when you are ready for this step, check out Settings. 4. When do you update? Select a consistent time of day that you will update. At lunch, right after school... just find a time that works for you... even at night after supper will work! 5. Be Consistent! Blog everyday! Always update, it will create interest and get people in the habit of checking your blog. Remember that by updating regularly you are providing information to not only parents, but students too, especially if they miss school. Parents and students may not check your blog everyday, but at least they know where they can go to access information on what's going on in your classroom. 6. How do you link and embed?? - Links are easy, copy the URL from another site that you want to provide a link to, then paste into your blog post or page... then hit enter to hyperlink the URL (this means makes the link "active") If that doesn't work, then highlight the link, then click on "link" on your Blogger tool bar and paste the URL in the window that pops up. 7. Finally, give the web address of the blog to the parents, and provide it to your Office Manager so that a link to your blog can be added to the school webpage! 8. Keep the habit of Agendas with students even if you have a blog. Really! This is an essential skill for kids and encourages them to be accountable for their homework... Therefore all the responsibility is not all on you as the teacher. However, keep in mind, as our students become more tech savvy, if they ask if it's okay for them to update notes in their phone or phone's calendar for homework... Let them... Meet them half way, just create the habit. Now that you have a blog, parents can confirm that their child is not lying to them when they say that they have no homework. Happy Blogging!! - If you think that you don't have time to update the homework on your blog, then select TWO responsible students to be in charge of it. These students should have excellent spelling and grammar skills. You will need two, so that in case one is absent, the other can handle the job. - Once you have selected you two students, give them the username and password to the blog. I would use a password that is different from the password you have for your personal email account. It should be something that is easy to remember, such as the name of the school, the name of the mascot, etc. - Select a specific time of the day when these students will update the blog, such as just before lunch. If you tell them to update it “whenever,” you’re going to find that “whenever” never shows up on some days. Make sure it’s a specific time every day. These students will then sit at your computer and update the blog. After the students have learned the essentials of blogging, let them take turns updating the blog. It doesn’t take two students to do this job. How can blogging improve writing and literacy? How can blogging be used as a Digital Portfolio? So you have heard about blogging with your students, and you are considering taking the plunge but just not sure what or how to do it? Blogging with students can be a way to engage and reach students using 21st Century teaching strategies. It can also be essential for teachers especially with classrooms where students have very little exposure to technology. As educators, not only is it important to teach skills in reading, math, problem solving, social studies, science, health... social development... (yes it goes on!) but also expose students to technology and help to bridge the "digital divide". So if you are ready to take the plunge into blogging, here are some tips to assist you. What are Your Goals for Blogging? 1. Pick an easy platform, both for you and the students. I used Kidblog with great success, it fit our needs, it is free and it offers easy moderation. There are other great alternatives out there such as WordPress or EduBlogs. 3. Talk safety! We assume some students know how to be safe, but don't assume it; teach them the do's and dont's. I came up with the lesson of why the Internet is like the mall and it really worked. I also sent home safety plans for students and parents to discuss and we discussed it throughout the year. Link to "Why the Internet is like the Mall"
Link to a sample agreement for "Safety plans"
4. Teach them how to comment. How to Compose a Quality Comment! from yourwonderfulteacher on Vimeo. Remember: 1. Compliment, 2. Comment, 3. Connect and 4. Ask a Question... Try to get a "little Converstation going", 5. Proofread! 5. Start small. The first post can be an introduction of themselves. It's an easy topic and about something they really liked to do. They can comment on each other's post as well, which can build community. 6. Include parents.This way parents can know what you are doing and can be invited to comment. This provides an extra home-school connection. 7. Connect with one or two classes to be buddies. This might be further down the road, but give it a shot. Comments from around the world are phenomenal, and the connections are essential to global understanding. So reach out on Twitter or try #comments4kids and set up something more permanent. 9. Visit other classroom blogs. Show them how other kids use it and have it inspire them. Blogs can be found through Twitter or the comments4kids site. 10. Let them explore. My students love to play around with font, color, and images. They taught each other how to do anything fancy and also let each other know when font or color choices were poor. This was a way for students to come into their own as creative writers and also start to think about creating their online identity or digital footprint. 11. Grade Only After Students Have Peer Revised and Focus More on Content. Blogging can be a way to practice writing for an audience and learning to respond to critique. Tell students your requirements and even make them go back and edit. After a prescribed amount of time for students to make changes, then grade. Some pieces of writing could be printed and included in a writing portfolio. 12. Challenge them. Often students are asked to write about particular topics but you can also have a blogging challenge almost weekly. The kids always wondered what the next challenge would be and looked forward to writing them. You could share creative writing pieces from class, or create electronic journals of work. 13. Link to your Blog! Any other multimedia that that students create can be linked to their blog. Think of the blog as an electronic journal or portfolio of the year's work. Glogs, avatars, prezis, or slideshows can be linked to their blog. Images or "Word clouds" through wordle can be downloaded and saved to blogs as well. All of this will allow students to comment on each other's projects and offer critiques or compliments... or even challenging questions for the students to think about. 14. Give it time! Some students embrace blogging right away, while others weren't so sure, yet they all admit that it was kind of fun. 15. Moderate the Student Blogs. This means that the students' posts and comments must come to you first before you approve them. You will have to keep up with the posts, this can be challenging... but just try it! 16. Blogs are Interactive Forums. Blogging allows students to be interactive and share ideas... learn how to challenge and defend ideas...Blogs are interactive forums for continuing conversations around topics of interest, and interactive forums require two-way participation. In order to do this, students need to become avid readers of blogs, too. Perhaps, organize a collection of student blogs in a public feed reader that your students can visit during silent reading time or while surfing the web at home. 1. Students who read blogs see models of writing that can be use as comparisons for their own work. 2. Students who read blogs are exposed to ideas for interesting topics that they may want to explore and write about in new entries for your blogging project. 3. Students who read blogs connect with potential audiences for their own ideas. Middle Grades - Grade 5... A very tidy blog! How Do You Evaluate Blogs? Check out the edtech guru's thoughts.... on "The Edublogger"
So now that you know how to blog... do you know how to Tweet??? How Do You Set Up a Blog for You Classroom? 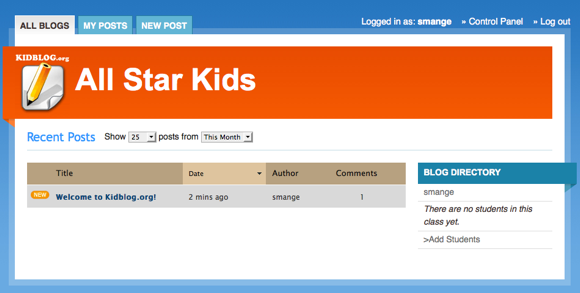 Kidblog.org is a service designed by teachers for teachers. They have made the process of creating and monitoring a class blog safe and efficient. Sign-ups are fast and simple, making it easy to co-ordinate a whole class of new students. At the same time, the blog’s privacy and security is protected by default. This makes life incredibly easy for the teacher, allowing you to get straight in to the fun bit of blogging! The teacher account is a straightforward sign-up: choose a password, add a few details and you’re in. The blog creation is controlled by “classes”. The theory is that you’ll want the class to collaborate on a blog together, with all members as users of that blog. 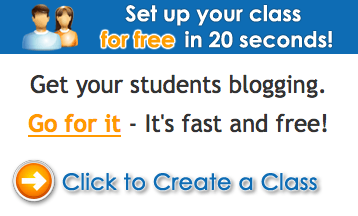 The class name is the blog name, which becomes part of the URL for the class blog too. You’ll want to set up initially as one class, even if there’s smaller group projects within the class, since the default privacy level is for students to be able to see other classmate’s work. If they’re not in the same class, they won’t be able to see it (or you’ll need to change the privacy). You’re limited to 200 kids per class, but it’s suggested that if you need more usernames you simply start a new class, add the new users to that and then invite them to the original class. You can easily keep adding classes every school year and importing the users from older classes. This gives the kids a little continuity, too. Permissions for viewing posts are set by default to “Class members only”, so only the people you’ve added to this class will be able to see posts. It’s also possible to add more teachers to administrate and to add parent accounts as guests if you want to enable parents to see the classwork. Comments are set to be moderated by default, so teachers will be able to block any of the nasty comments made by certain kids. If you do choose to make the blog public, you can continue to filter unsolicited comments. Adding users can be done individually (I prefer this method, it's been easier overall) or as a bulk upload, which is recommended. The bulk upload involves creating a .csv file with just name and password. You can do this easily by using a spreadsheet with a column for name and a column for passwords, then exporting it as a .csv file. Once the users are added, they can log in and start writing straight away. If you’ve got several groups of kids in the one class all working on different group projects, you’ll want to set up appropriate “Groups” each with relevant names. Once the groups are set up, kids viewing the blog can look at posts just by one person or filter to show just relevant groups. I like to set mine so that All groups (or members of that class) can read the posts. Tell your students to go to the blog URL (you find your blog URL by clicking on the “Go to Class Blog” link at the top of your dashboard). 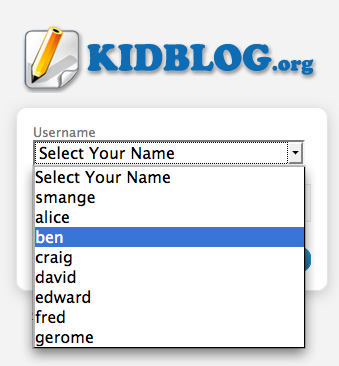 Kids can click on the “Log In” link and they are given a drop-down list of names to choose from. So, they only need to remember a password! Once logged in, they can browse their friend’s posts or filter for groups using the drop-down menu. They can write posts which must then be moderated by the teacher before publishing. 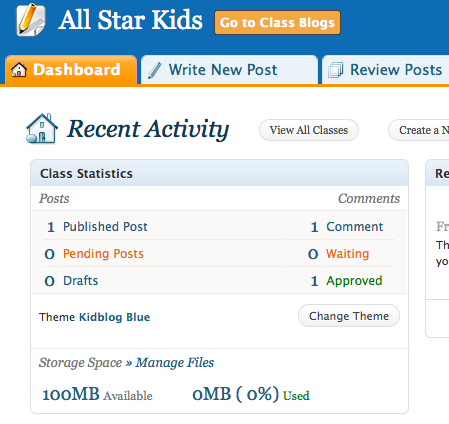 Kidblog is based on WordPress, but has been customised with a teacher’s needs in mind. It’s free, uncluttered, ad-free, easy to set up and private by default. No information is collected from students and the teacher remains in control of all activity. There is a small selection of default themes, so you can determine your "style". Try Kidblog! The possibilites are endless: writing groups; book clubs; assignments; group work; uploading photos of artwork; share links to other on-line projects (Glogster or Voki or Prezi) ; or even use it as a Learning Log where kids can share what they learned that day. What will you use Kidblog for? No really, please feel free to share! Last year we blogged Response Journals via Kidblog... and for the first time ever, grade 7/8's were actually making authentic comments on each other's work! We also blogged for a Social Studies Project with a UN Peacekeeper (I lucked out having a friend from the RCMP who went to Southern Sudan for the Referendum and formation of a new country), this was quite a cool and memorable experience for the students... It really made the Current Event "Real"! So once you feel comfortable with blogging, it will be time to try other engaging elements. To add a video, it's pretty straightforward. If the video is from youtube, then from youtube, click on "Share" - immediately a link and an embed code will pop up. However for kidblog (unlike Blogger) you will need to get the video link. Create a new post (or go to the post you want to add a video to), then click on the post "Toolbar", and add the video link URL in the place indicated in the pop up box. 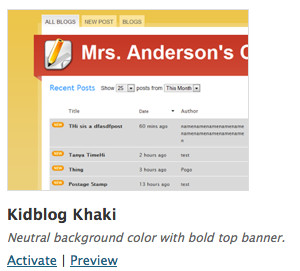 Click on preview, and your video should be embedded into kidblog. If the video does not allow for embedding, then you will just have to link it. Most pictures will just copy/paste straight from one website to kidblog. It's pretty easy. Go to Wordle.net and create a wordle word cloud (usually a word cloud is about a particular topic... ie: what are the key elements of plot for The Hunger Games?...). Create the Wordle, enlarge the image to full screen and take a screen shot. *After you make your Wordle, on the bottom of your picture, click “open in window”. *Then, click the maximize button then press the Print Screen button (usually at the top right hand keyboard). If your using laptop and have the funtion button a.k.a. “Fn” ( beside the ctrl button) you have to press it at the same time. *Next, you have to use the Paint application. When you're on paint, click ” Ctrl + V “. Your wordle will automatically pop up the screen, so click on the image and just crop it. *If you don't have PAINT, you could use the microsoft WORD document or the POWERPOINT. Just also click ctrl + V and it’ll pop up. Click CTRL + S to save your work and put the file name. Or just file save as a jpeg. 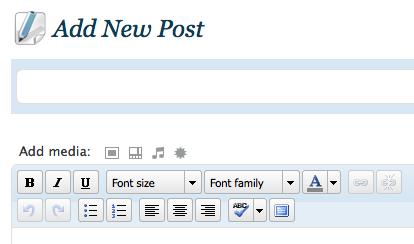 *Click the ”Add Media” button (above the font sizes where you type the blog post). Click the “from the computer” tab then locate the picture you saved. When you see the picture, click the insert it to the post button then you’ll see your wordle. Students can link their work from other Web 2.0 sites, like work from Glogster, Eduglogster and Prezi. Students will need to link their particular electronic document to their blog, not just the general site address to the blog. These projects can be shared with classmates and comments can be shared. 2. Click on “Share” on the bottom right of your Prezi in the box. 3. A box will pop up with the embed code and link address for linking to a blog. 5. Select or (highlight it)the address you just pasted, click on the link (or chain button) and paste in the address into the window that pops up. *Your link to your Prezi will now work. 2. Highlight or select the URL address, click on the link or the "chain" picture in the toolbar. 4. Your link should work if you did the steps correctly (note the http:// element as stated above). Voki's or avatars are free (unless you chose the classroom site) and allow students to create a character (like a character from a novel) and record a narrative using a microphone headset (you could call the phone number on the site, but it is long distance to New York). Vokis once created (students will need to create an account... It's free, then paste the embed code into the post on Kidblog or even create a link to the voki that they created. Go to voki.com and check it out. This is pretty straightforward once you are on Kidblog. Just click on the type of file you want to link to Kidblog and chose the particular file from your computer. At school it might take a LONG TIME. So maybe try at home. Here is a Dystopian Unit for Blogging that I created last year. Do you Teach GRADE 8 ELA? Scroll down and look for the Dystopian ELA unit... on this page of this blog. If you want more to read, here’s some articles that might provide inspiration on ways you can use Web 2.0 resources.